Our well-priced, basic down comforter is lightweight and comfortable. It's designed to provide an affordable introduction to the fluffy comfort of down bedding and can be enjoyed all year long. Two words come to mind: 'Exquisite comfort'! I've never slept more comfortably and luxuriously. Upgrade your sleep with the lightweight comfort of our Classic Comforter with 550 fill power Hyperclean® down. All our signature features come together for a great introduction to the Pacific Coast® world of down bedding including our sewn through diamond box design and Comfort Lock® no shift border. Both these features work to keep the down evenly distributed over your body with the fluffiest down on top. 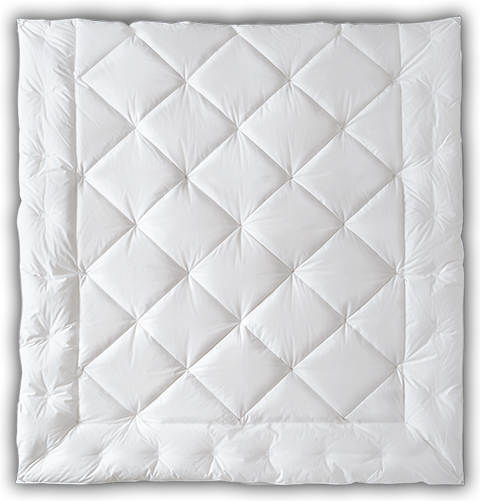 The cover is made of breathable 100% cotton with a 230 thread count and also includes convenient duvet loops to secure your comforter. Navy blue cording outlines the perimeter. This entry level down comforter will exceed your sleep expectations providing you with year round enjoyment.